For a few weeks now, FIFA 18 players have been able to partake of their very own World Cup mode on consoles. 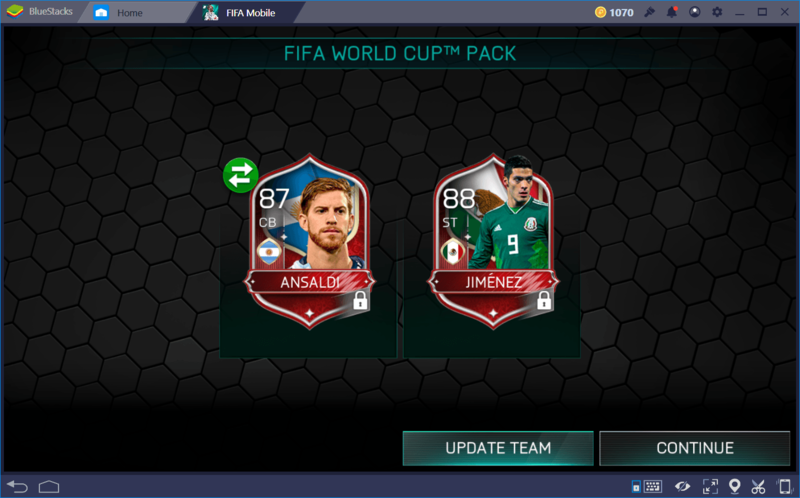 Now that the real World Cup has started, FIFA Mobile players may also partake of this unique and awesome activity for a chance to win unique and amazing rewards. 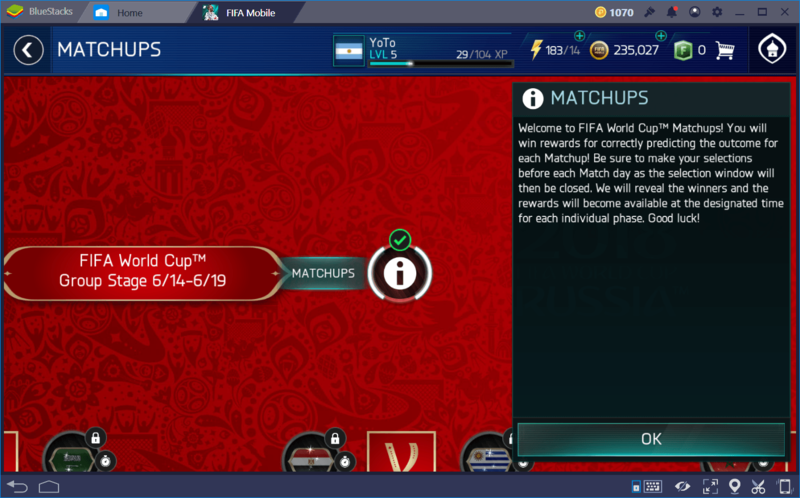 The World Cup mode in the mobile version of the game started around a week ago, on June 6th and will extend until August 1st. During this time, players will be able to choose from 32 qualifying nations and play through many events alongside their favorite country’s squad. 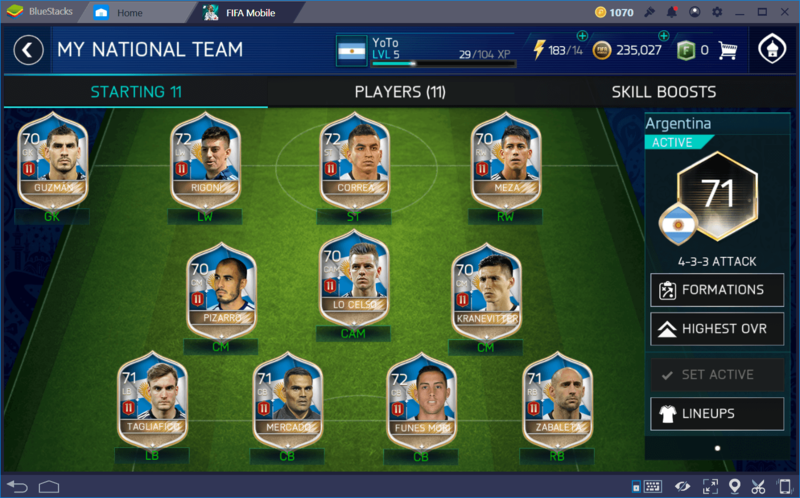 If your favorite team didn’t make it to the world stage this time around, don’t worry, FIFA Mobile also lets you choose from 16 other teams that didn’t make the cut, and play through their very own story mode. That being said, this is the biggest event that FIFA Mobile has ever had in its young age. The largest event in soccer history is equally large and prestigious in the game. There are no player advantages here: the progress players have made in the main game doesn’t count in World Cup mode. 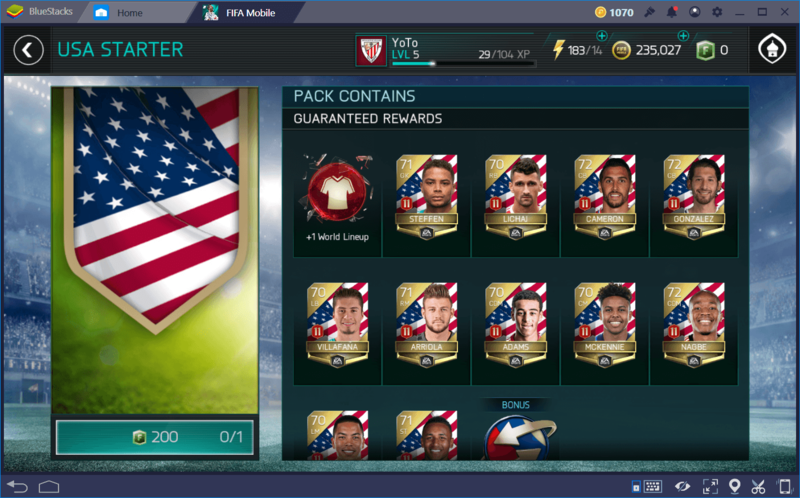 This time around, players get assigned a team depending on the nation they chose, and have access to new players, new training XP items, as well as new skill boosts, all of which are completely independent of the main game. In World Cup mode, everyone has to start from the beginning. This event can be a bit confusing due to its sheer size. That’s why we at BlueStacks decided to create this handy little guide; so you know exactly where to start and how to progress in the awesome new (temporary) game mode. World Cup mode is absolutely massive — it even requires its own separate download. 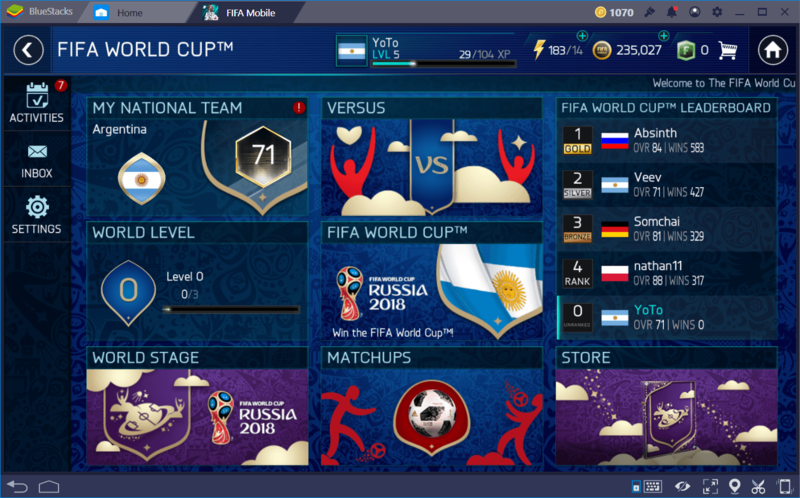 After clicking on World Cup mode in the main menu, you’ll be taken to a brief tutorial, after which you’ll be able to choose a nation to represent. Depending on your choice, you will be assigned a different team. We chose Argentina (because Messi), but you’re free to choose whatever team strikes best with you. Unfortunately, if you’re not happy with your choice down the line, there’s no easy way to undo it. In order to pick a new nation, you’ll have to buy them from the store at the price of 200 FIFA Points each. After picking a team, you’ll be taken to the World Cup main menu, which is oddly similar to the regular main menu, but with a different color scheme. This just goes to show you how big the event actually is. 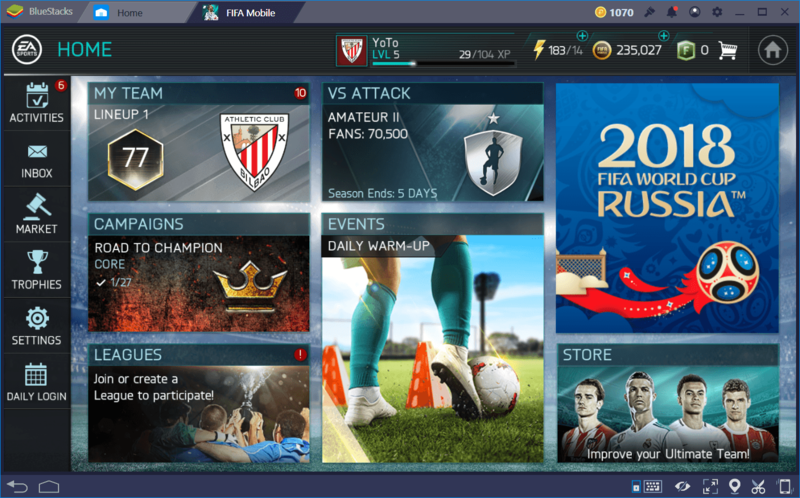 Like the regular game, the World Cup event has its own campaign mode. We recommend that you start here since this mode gives great rewards to quickly get your team in shape. With that in mind, it’s fair to say that this mode offers lots of matches and challenges similar to the main game. To obtain the best results, we always recommend using our Android emulator, BlueStacks, which gives you a better view via a much larger screen, better graphics, and a vastly improved control scheme over standard touchscreen controls. 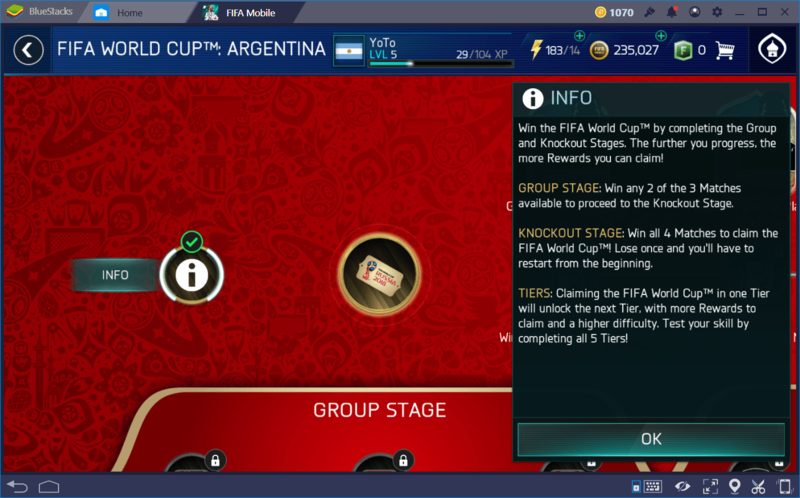 Not only that, but you can also minimize the emulator at any time in case you need to make a quick search for player info (or in case you want to read this guide while playing the World Cup event! ), which can really improve your odds of success in any mobile game. Keep in mind that, if you buy another nation from the Store, you can participate in more campaign chapters, which gives you even more loot and chances to obtain unique benefits that are very important to progress in the event. If you chose a qualified nation, you can hop directly into tier 1 campaigns. However, if you get stuck with a non-qualified team, you’ll have to play through a qualification prologue first before being able to hop into the action. It really doesn’t matter which team you chose at the start because, as we mentioned before, you can always purchase other nations, and because all nations receive similar rewards for completing campaign chapters. Furthermore, every nation has their own share of Elite and Master player cards. However, if you’re really into nice art, non-qualified teams have their own special portraits. Starters: These are the ones that you receive when you first pick a nation to represent. They have no skill boosts. Base: These are the standard players you will receive in World Cup packs and from Vs. Attack Mode in the World Cup event. Campaign: These players can be unlocked and received by completing the World Cup campaign chapters. World Level: These are the best of the best, and can only be obtained by leveling up in the World Level section. Training XP: The TXP obtained in this mode can only be used in World Cup mode. It is called WC TXP and can be applied to any WC cards. Skill Boosts: Just like TXP, the World Cup event offers unique skill boosts that can only be used on WC cards. 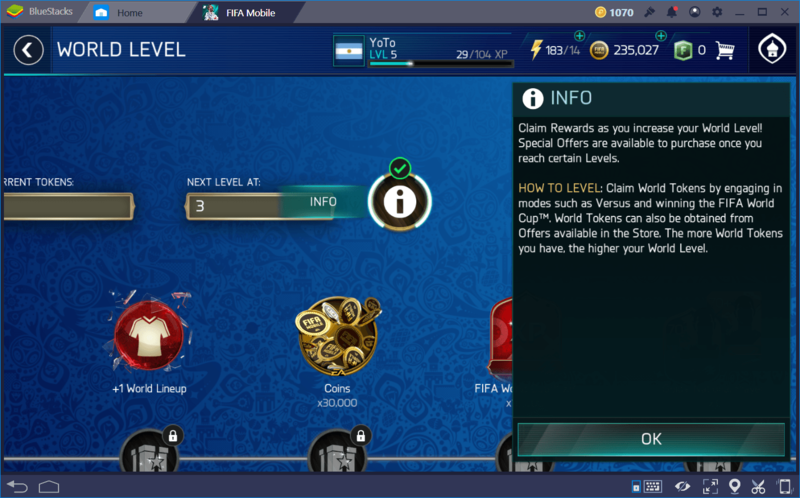 Keep in mind that the inventory space you have in the main game is shared with the World Cup event, so make sure you have enough room for all the extra goodies you will receive in the special mode. Furthermore, it’s important to note that there is no market in this mode; all the players and stuff you receive here cannot be traded, and can only be used in the WC mode. World Tokens: Very important. Can be used to advance your World Level. Bonus Points: Can be exchanged for all sorts of prizes and goodies, such as WC TXP, skill boosts, Coins, and even players from the store. Exchange Points: Can be used in the regular store to redeem prizes for your Ultimate Team. Program Points: There is no use to these yet, but you will be able to trade them in once the World Stage unlocks. This is where most of the action happens in WC mode. This mode is split into 5 tiers, all reflecting real-world scenarios. Each tier is increasingly difficult, and consists of phases from the real World Cup, starting with the group stage, and then up to the finals. Keep in mind that you need at least 2 wins to advance from the group stage. If you fail to achieve this condition, you will be sent back to the beginning of your WC run. Qualifiers are even more difficult; a single loss takes you back to the group stage. The WC event has its own Vs. Attack Mode, in which managers can play up to 10 matches each day. Once the daily limit has been reached, they can pay 300 FIFA Points to reset the counter to 0 and keep playing. Also, they can watch an ad every 8 hours, which will give them a random WC item. Everything you do in the WC mode is just so you can earn World Tokens. These are the most important things in the entire event, as they will allow you to increase your World Level and give you the chance to receive better rewards for your trouble. 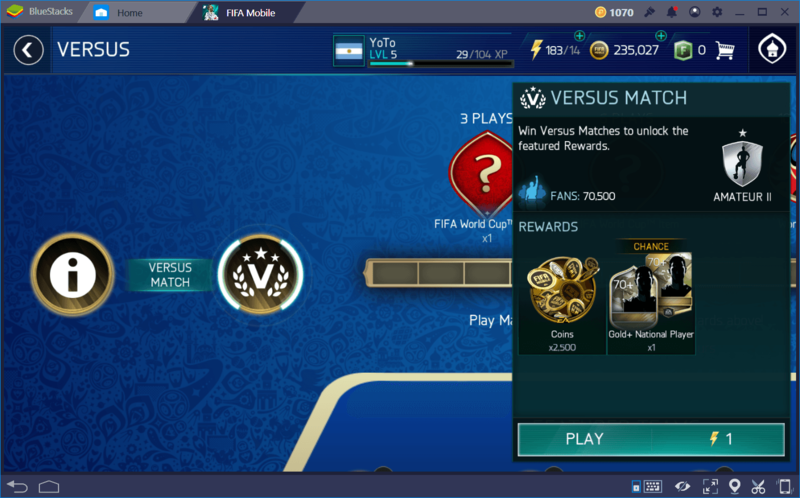 There is also a special matchup section that lets you predict the outcome of real-world WC matches for a chance to earn awesome rewards. The WC event has a little bit of everything for everyone interested in this awesome occasion. We hope that, through this brief guide, you are able to gain your bearings and make your way through the ranks of the WC. Also, don’t forget to checkout the BlueStacks World Cup 2018, in case you haven’t already. It is a fun and engaging way to feel connected to your favorite teams during the ongoing FIFA World Cup and you get to win lots of exciting prizes while you do so!